Saint Hilaire De Riez (85) Studio - Sea view - for 4 pers. Property 4: Saint Hilaire De Riez (85) Studio - Sea view - for 4 pers. Coquet independent apartment between sea, forest and marsh. Property 5: Coquet independent apartment between sea, forest and marsh. Sea Luxury 7 th of Elbée St Jean Gd balcony 2ch. including a sea view. Unique! Property 10: Sea Luxury 7 th of Elbée St Jean Gd balcony 2ch. including a sea view. Unique! the beach 50 meters from the studio 4 per overlooking the island of Yeu in the horizon. 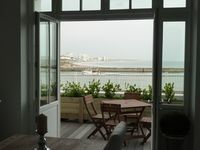 Property 11: the beach 50 meters from the studio 4 per overlooking the island of Yeu in the horizon. A Very Functional Apartment Only 200 Metres From The Beach! Property 23: A Very Functional Apartment Only 200 Metres From The Beach! Large apartment of 120 sqm facing sea, breathtaking views! 3 bedrooms, last floor. Property 26: Large apartment of 120 sqm facing sea, breathtaking views! 3 bedrooms, last floor. Facing the Sea Luxury, East-West expo 280 ° view up to 3 people. "Welcome Baby"
Property 32: Facing the Sea Luxury, East-West expo 280 ° view up to 3 people. "Welcome Baby"
SUNNY APARTMENT IN FRONT OF THE PORT and NEAR CITY CENTER. Property 40: SUNNY APARTMENT IN FRONT OF THE PORT and NEAR CITY CENTER. Notre semaine a &eacute;t&eacute; super. Location au top. Propri&eacute;taires, des gens vraiment tr&egrave;s gentil et tr&egrave;s accueillant. Je recommande, car la location a tout, et d'une propret&eacute; que l'on ne retrouve pas toujours ailleurs. Bref c'&eacute;tait trop cours pour nous. A revoir surement.